A little while ago, I was introduced to a couple of new breads on the market. While the brand name has been producing gluten-free breads for awhile now, it wasn’t a brand that I actively sought out. Yes, I saw it all the time in the freezer section of Whole Foods and other natural food stores, but I had grown accustomed to snagging Rudi’s or Udi’s or (now) the Aldi liveGfree brand or Canyon Bakehouse. Food For Life was there…I just always overlooked it. Who knows? As an active (even now, with an injury) athlete, it’s important to properly fuel my body and eat wholesome foods. Most products on the market for the gluten-free diet happen to be junk food. It drives me nuts. I hit that gluten-free section of a store and I can find a vast array of cookies, crackers, chips, pretzels, and the like. It is one of the biggest pet peeves of the grocery store. Yes, a lot of people with Celiac and gluten intolerance do miss out on some of the finer treats like Oreos and the like, but the shelves are literally overrun with products that aren’t going to feed your body right and healthy. The hardest part, for me, was choosing where to begin. It had been a long and tiring week and I was looking for a nutritious, but filling dinner. And, as breakfast is one of my favorite meals of the day, I decided to hit up one of my favorite recipes and have breakfast for dinner. 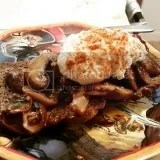 Hence, it was time to bust out a very British, and all-time favorite in my book, breakfast recipe – Mushrooms On Toast. And I had the perfect vehicle for the toast portion in my kitchen freezer. 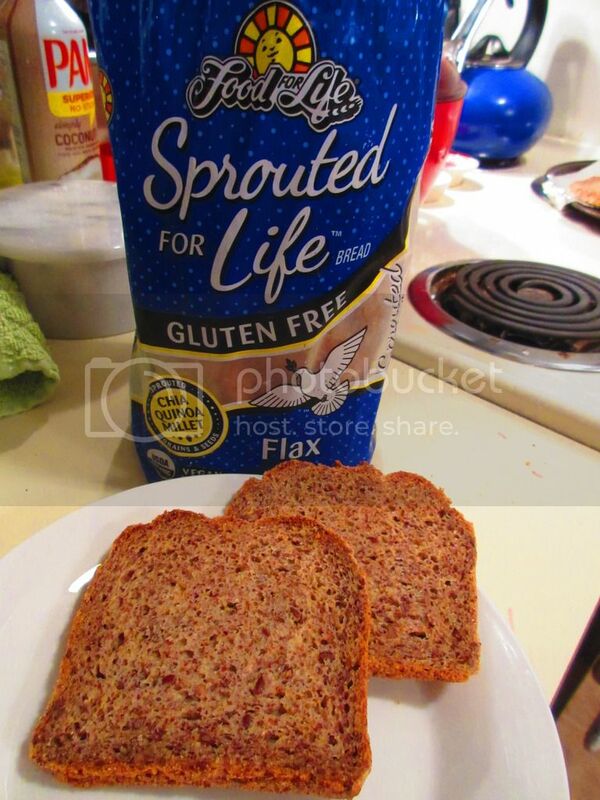 I consulted with my roommate and we decided to start with the Food For Life Sprouted For Life Gluten Free Flax Bread. I thawed out four slices of the bread and then prepped them to toast in the oven while I prepared the rest of the meal. This involved sauteing up mushrooms, red onion, garlic, seasoning, and some of my homegrown fresh thyme. I made it creamier with rice milk. And then poached some eggs to top off the entire dish. Food For Life Sprouted For Life Gluten Free Flax Bread turned out to be the perfect vehicle for Mushrooms On Toast. The bread is firmer, and stands up a bit more to toppings and the like. I was a bit worried when I thawed it out, as it seemed really dense and heavy, but that was ideal. That was, actually, a good thing in this case. The Flax variety of the Sprouted For Life line of gluten-free breads is amazing. It is dense and has this rich nutty flavor to it. The texture, if made into a sandwich might be a bit dry and heafty, but in a dish like this, where a sturdy bread is needed, it is ideal. In fact, this bread was almost like a sourdough, and that was where the magic was with this bread. I loved the crunchy, sturdy nature of the bread when topped off with the creamy garlic and mushroom sauce. It held up to the runny middle of the poached egg and even a smattering of hot sauce. It was crispy, and delightful with each spoonful. Seriously, any other bread would have gotten damp and soggy, but this…this held up and stayed a piece of toast throughout the entire eating process. Food For Life Sprouted For Life Gluten Free Flax Bread is rich in essential fatty acids and was developed specifically to help you perform at your best. With a great balance in the nutritional aspect, this bread is quite appealing. Made with sprouted chia, sprouted quinoa, and sprouted millet, this bread is a trio of health. And the flax is an added bonus for sure. Let’s talk about ingredients. Food For Life Sprouted For Life Gluten Free Flax Bread is made from organic sprouted quinoa (red and/or white), filtered water, organic arrowroot, organic potato starch, organic sprouted millet, organic tapioca, organic sprouted flax, organic applesauce, fresh yeast, organic safflower oil, organic cactus, organic sprouted chia seeds, organic agave, organic vanilla, sea salt, vegetable gum (xanthan and cellulose), and organic psyllium. It is gluten-free, vegan, high in fiber, cholesterol free, and free of added sugars. So, let’s talk nutrition. Since starting my nutrition course (oh…did I not mention that yet? ), I have learned that there is more to counting calories. Sure, it is important, but it shouldn’t be the focus. It’s all about the nutritional aspects of the food. Avocados are high in fat and calories…but SO much better for you than that chocolate bar with the same amount of fat and calories. See what I mean? So, a serving of Food For Life Sprouted For Life Gluten Free Flax Bread is one slice of bread. This slice of bread will give you 110 calories and 2.5 grams of fat. This bread is free of saturated fat and trans fat (YAY!). The Flax Bread also will provide 115 mg sodium per slice, 0 mg cholesterol, 21 grams carbohydrates, 4 grams of fiber, 0 grams of sugar, and 2 grams of protein. I was freaked out at first with the high calories per slice, but, again, not all calories are created equal and there is nothing fake going into this bread. It’s all healthy, all good, all nutritious. Making this a fantastic choice. I was so excited to receive the loaves of the Food For Life Sprouted For Life Gluten Free Breads. And if they are all as amazing and delicious as the Flax variety, then I am in for a treat for sure. My hat is off to the nutritional value, the top-notch ingredients, and the amazing taste of the new Sprouted For Life Gluten Free Flax Bread from Food For Life. My only complaint, as with most gluten-free breads out there, is the small size of the loaf. Aside from that…amazed. Happy to have been given the opportunity to really try it out. I am beyond impressed. So…I was in Boston…for The Boston Marathon. And you know what it means when I’m gearing up for a race. The traditional night-before-the-race gluten-free pizza. It is a must. Sure, I can do gluten-free pasta, but pizza seems to be my mojo. My magical little race-day helper. And so, this tradition has gone unchanged whenever possible. I consulted with a good friend of mine, Julie, before heading to Boston, looking for restaurant recommendations, especially for pizza. She sent me so many different options, I was elated to see how many options were available in Boston. If you are a Celiac or gluten-free and planning on a trip to Boston, trust me…it is so easy to find something to eat there. It’s wonderful. Never before have I had so many options in one place. With her high recommendation, and the praise of my high school friend, Lydia, it was decided that we would be noshing on Sunday night (Monday is marathon day in Boston!) at a place called Upper Crust Pizzeria. They have several locations throughout the Boston area, but as we were spending the day hiking the Freedom Trail, we decided that we’d wind our way out toward Beacon Hill and land there right around dinner time. We actually ended up getting there sooner, rather than later, so we ducked into some candy shops and walked around the Beacon Hill area until around 5 p.m. That was when we made our way back to the little establishment and stepped inside. It wasn’t what I was expecting. This was one tiny little establishment, indeed. In fact, the kitchen was on the far right as you enter, with one long community table in the middle of the restaurant. That was it. We lucked out in that people finished up eating by the time we ordered, so we had a place to settle in and eat. Because there was no way the pizza would make it back to the hotel and still be hot. Cathy and I had scouted the menu prior to leaving for Boston and already knew what we were going to get. 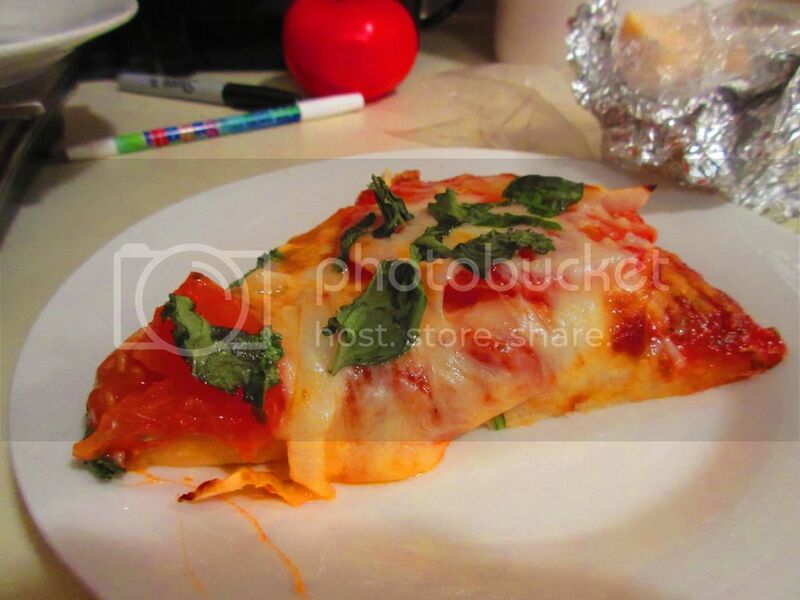 This left my friends Heather and Jenn to either have pizza by the slice or split a pizza. As Heather wanted pepperoni and Jenn does just cheese, they ended up getting two slices each. Their slices were ginormous!! Seriously!! Holy cow. It made me more than a little concerned over how big the gluten-free pizza slices were going to be and whether Cathy and I could eat it on our own. 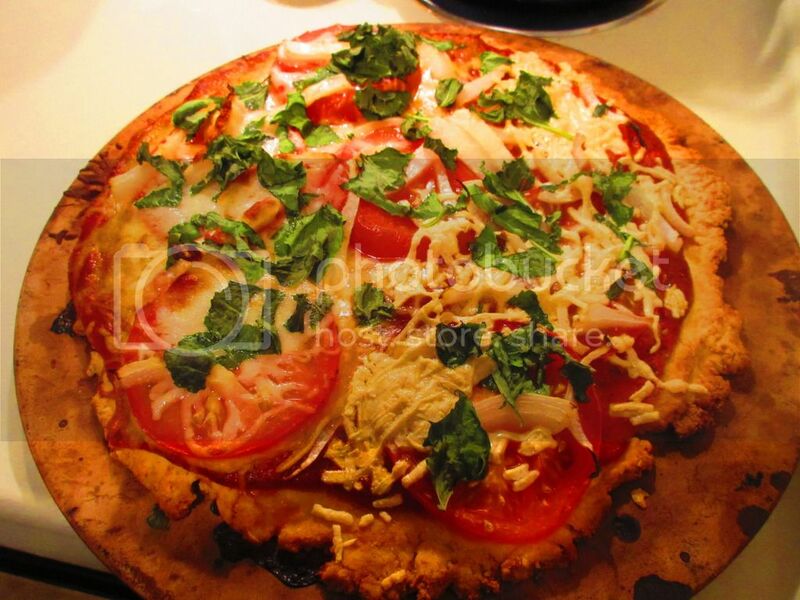 But, our 14-inch gluten-free pizza arrived a short time after their slices…and it looked fantastic. We ordered one of the custom pies that is a “local favorite.” It’s called Charles Street ($19.00 – the gluten-free crust is a $2 upcharge), and we had it made on the gluten-free dough. 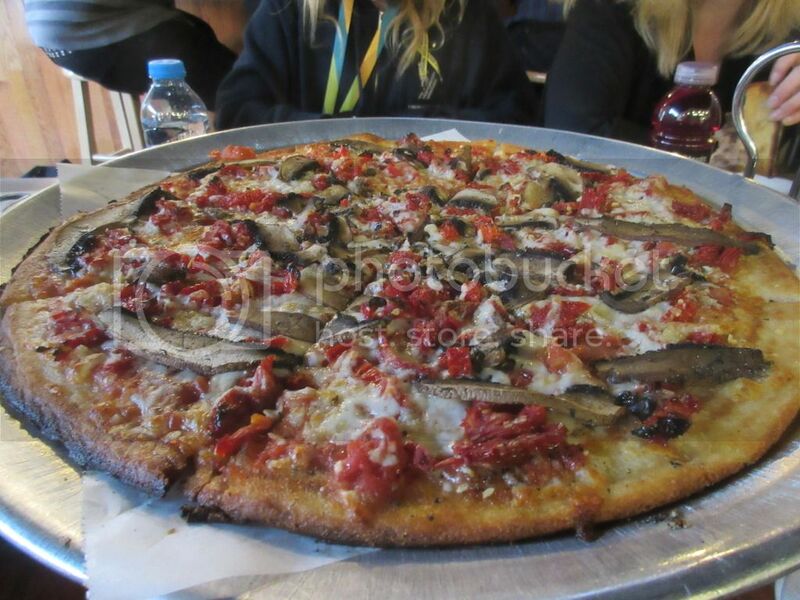 It comes topped with portabella mushrooms, sundried tomatoes, and fresh garlic. For the sake of my stomach, we asked them to go light on the cheese on this pizza. And it looked absolutely fantastic when it arrived at the table. We paused long enough in our hunger to snap a picture before diving in, each peeling off a slice. The pizza is their “small” size…and it’s actually quite big…but it was perfect for 2-3 people to share. And since we hadn’t eaten much that day, it was perfect for Cathy and I to split without any help. The Charles Street pizza at Upper Crust Pizzeria is AMAZING! A-M-A-Z-I-N-G!! Totally and honestly. I ate a bite on its own and immediately was all “Mmmmmm.” Like in “Mmmmmmarathon” and “Mmmmmmore please” and “Mmmmmmgoooooood!” But then, I doctored it up with some dried herbs and a little bit of red pepper flakes. My stomach fears no spice, not even before a marathon. The crust of the pizza was thin, but not a cracker crust. You could definitely tell it was white rice flour based, but it wasn’t a distracting overlying taste. In fact, the crust was one of my favorite things about this pizza. I love a good crust, but I also love to indulge in more pizza…so a thin crust is a nice thing in my book. Cathy tried a bit of Jenn’s pizza and said the gluten-free crust was even better than the original. Score!! I loved the earthiness that flavored this particular pizza. The Charles Street had this great balance of savory with a hint of sweetness from the sundried tomatoes. It was amazing. I devoured every slice. For the first time ever, I think Cathy finished her pizza just as I was polishing off mine. I can’t say enough good things about this pizza. At first I was a little uncertain, due to the venue more than anything. I mean, one table…and no room when we arrived for us to sit and enjoy…it was a little intimidating and off-putting…but a spot cleared up and we settled in after ordering, and all of us were happy with our pizza. I would go back and eat here the next time I was in Boston, even if there wasn’t a marathon involved. Really fantastic. There were a few other signature pizzas that they make that sound absolutely amazing, so I’m definitely eager to return and give them a taste. 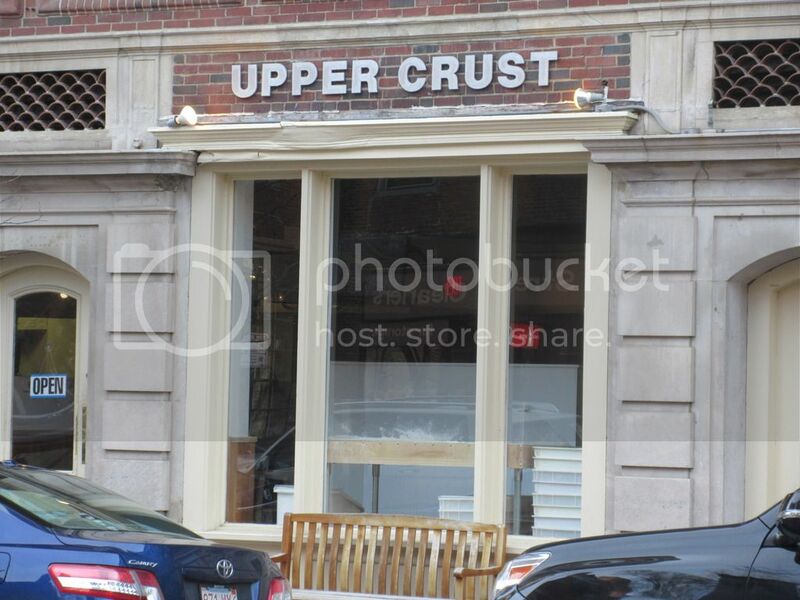 If you’re in Boston…and you want a great gluten-free pizza…find one of the locations for Upper Crust Pizzeria (or go to the original one, like I did, in Beacon Hill) and order up a slice of heaven in pizza form. I know I’ll be back. Oh yes, I will be back! Sometimes, it’s not just my pantry that keeps products for awhile. Back at the beginning of summer, I finally found a local store that carried a certain sandwich bread that I had been searching high and low for. You see, gluten-free bread has always been expensive, and since this particular bread only came with 8 pieces and was about $7.00, I really needed to make sure my budget was going to allow for it. And so, it was because I finally had it within my clutches, I purchased a box of Amy’s Kitchen Gluten Free Sandwich Rounds. Amy’s Kitchen and I are BFFs. For real. Her gluten-free products are amazing. All of her products are vegetarian…with a good chunk of them being vegan as well. How’s that for amazing, eh? I haven’t met a product from Amy’s Kitchen that I haven’t fallen in love with. And, for awhile, I was stashing her frozen meals and canned soups/chili in my freezer and/or pantry. When I moved to more of a clean diet, I went for more natural foods rather than frozen and processed. But Amy’s still had a place in my heart…and when anything called for vegetarian chili or the like…it is her brand that I turn to. So, when I saw online awhile (like years!) that Amy’s Kitchen had created gluten-free Sandwich Rounds (I assumed these were like Sandwich Thins), I went on the hunt. When I came up empty handed, I just sort of gave up on it. Until Earth Fare opened up in my area…and lo and behold…there on the shelf…the Sandwich Rounds. No conversation or budget stopped me from putting that in my shopping basket and bringing them home. Into my freezer. And…there they sat. For a long while. I just kept buying loaves of bread. I didn’t even think about these again until I was reorganizing my freezer and starting to work through the items inside. And when I rediscovered them…I had an idea of how to use them. Because I had been craving. So, I picked up some of my favorite gluten-free veggie burgers from the store on Sunday (Franklin Farms is the brand, in case you were wondering…delicious and low calorie!). And this morning, I pulled the box Amy’s Gluten Free Sandwich Rounds out of the freezer and removed two of the flat breads to thaw while I was at work. And this was my only disappointment with this product. I thought that these would be a lot like the Sandwich Thins I used to eat when I was eating horribly unhealthy “diet” bread. Those were thin little bread rounds that were sliced in half. 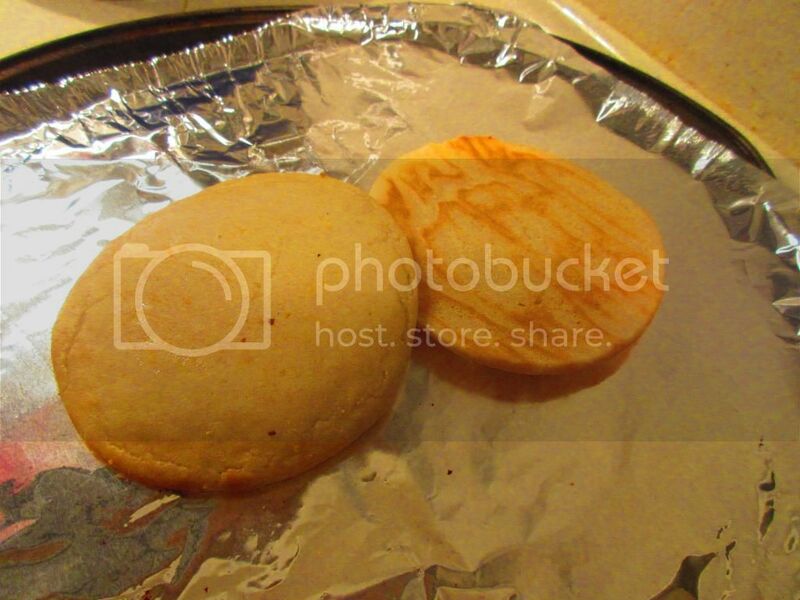 These looked like small three-inch pizza crusts more than sandwich bread. And…in order to actually make a sandwich (or in my case a burger), I would have to double the bread. One piece is just that…one piece. No way to slice it in half to make a sandwich you can pick up. So, forget about that burger…it now became and open-faced sandwich tonight. So, yeah…I was already a little disappointed. But, after I slid the Amy’s Kitchen Gluten Free Sandwich Rounds into the oven to toast slightly while the burgers cooked and the mushrooms and onions were marinating in bar-b-que sauce. As those finished up, I removed the now warmed thin bread rounds from the oven and began to put together the open faced sandwiches…trying not to be too disappointed that in order to make an entire burger, I’d have to double my calories and everything else. So…this would have to do. A little BBQ sauce on the round, then the veggie patty, melted vegan cheese, and then the barbeque onions and mushrooms to top it off. I served it with a side of Zapp’s New Orleans Style Voodoo Kettle Chips (which are totally amazing!). Settling into dinner with an open-faced burger instead of an actual burger was a bit of a let-down. But…after I took my fork and knife and sliced into everything and gave it all a taste…all was forgiven. The Amy’s Gluten Free Sandwich Rounds are totally amazing. In fact, they taste like mini pizza crusts. So, now I kind of want to do little individual pizzas and use these as the base. They are amazing. 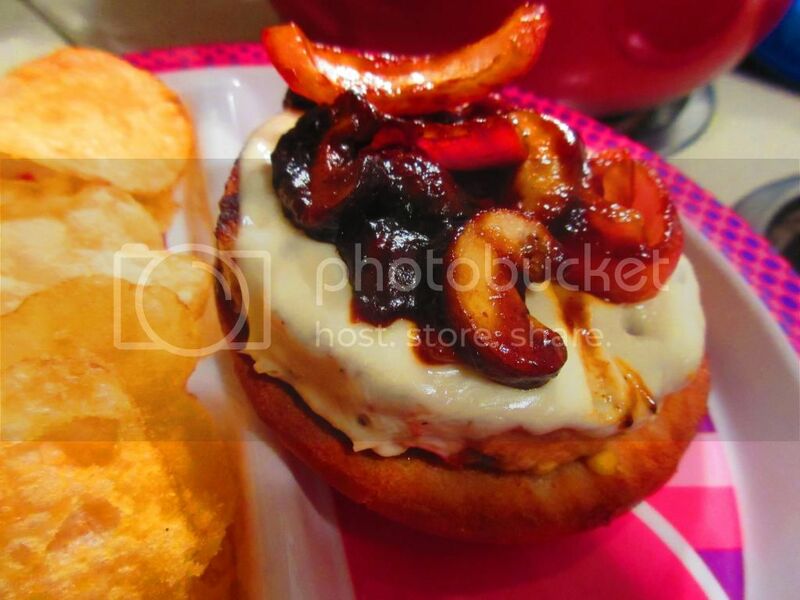 And they even held up to the sauce, the burger, the toppings…without getting soggy and falling apart. Color me impressed. The disappointment for not being able to pick up my dinner faded. The taste, texture, and all-around goodness of this product made up for it in spades. Holy cow! Let’s look at the ingredients! Amy’s Kitchen Gluten Free Sandwich Rounds are true to Amy’s Kitchen form. Using only ingredients that are recognizable. No fake stuff here. These little sandwich rounds are made from organic rice flour, filtered water, organic sunflower seed meal, organic tapioca starch, organic potatoes, organic extra virgin olive oil, organic agave nectar, sea salt, yeast, and organic rice bran extract. These little sandwich rounds are gluten-free, dairy-free, soy-free, vegan, cholesterol free, and kosher. Love it. A serving of Amy’s Kitchen Gluten Free Sandwich Rounds is (sadly) one round. This one round piece of bread will provide you with 90 calories and 4 grams of fat. This serving will also give you only 135 mg sodium and 1 gram of sugar. You will also be taking in 1 gram fiber and 2 grams of protein. So, they aren’t very filling, but it’s nice not to have a calorie-laden burger/sandwich. I only wish these could have been split so that I could have picked up my burger instead of having to go all fine-dining on it with a fork and knife. 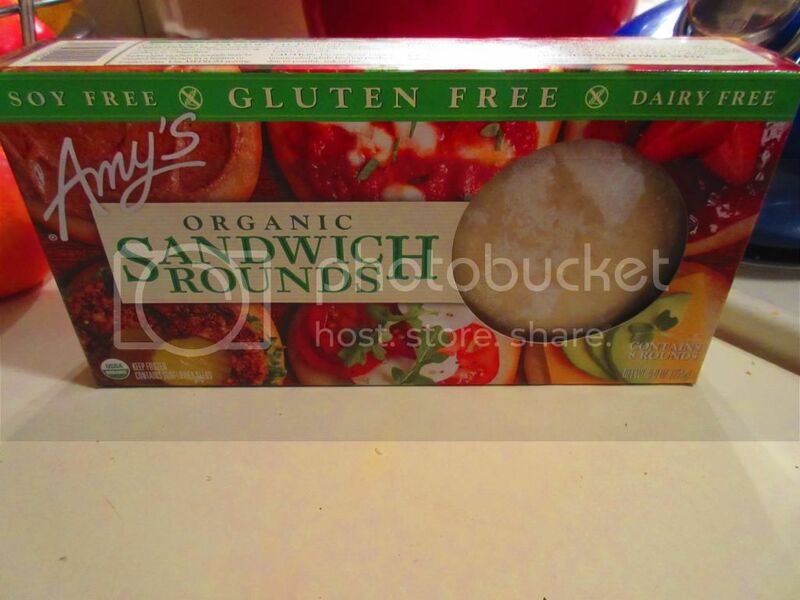 I am not kidding…Amy’s Kitchen Gluten Free Sandwich Rounds are fantastic. If you happen to find these in your store, I recommend the splurge. Make an open face sandwich…or if you don’t mind 180 calories and 8 grams of fat in one sitting…make a full one. For me…I think mini pizzas are up next. What started off initially as disappointment transformed into nothing but pure joy. This product is truly amazing. I love them! 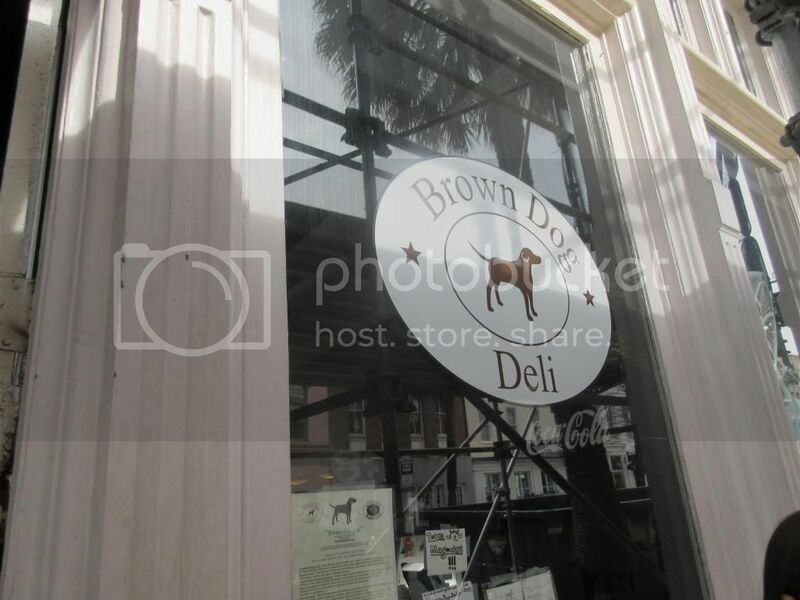 The Brown Dog Deli is definitely one of Charleston, South Carolina’s little gems. It’s definitely not your average deli…but it is serving up some fantastic food. And if that doesn’t sound like an intro to Diner’s, Drive-In’s and Dives…I don’t know what does! But let’s face it…I don’t sugarcoat things. And when I am told over and over again by my Charleston regulars, Amanda and Richie, that I must go eat at the Brown Dog Deli…well you bet your sweet tennis balls and Nylabones that I do. HA. Dog references FTW. Don’t you love it when I laugh at my own jokes? With this in mind, and packed schedule on Saturday, we made the decision to hit up the Brown Dog Deli on Sunday morning/afternoon for an early lunch of sorts. And after wandering around downtown, hitting up the market, shopping, and just taking in some of the history and beauty of Charleston, we were ready to sit down to a light-ish lunch. We were doing dinner out that night, so we wanted to hit this up early. Naturally, this means we got there at noon. HAHA! But, it was okay. This funky little diner is located on Broad Street in downtown Charleston, and everyone seems to love it. When we arrived, at around noon on-the-dot, we were greeted by a server and led to a booth. The place had a few other people in there, but it wasn’t hopping. Our server, Meredith, came over to get our drink orders. And Cathy went ahead and gave her the heads up on my food allergies and dietary restrictions. She immediately came back with the fact that they had gluten-free bread and wraps and that they had a separate vegetarian/vegan menu. She retrieved that for me and then filled our drink orders. I originally was just going to get the Gluten-Free Hummus and Veggies Wrap ($6.95), which would have been a wrap made with roasted red pepper hummus, cucumbers, carrots, tomatoes, red onions, feta, sprouts and spinach. It sounded really good…but the more I looked over the menu and the more my friends were talking about all the different things they were getting (and with the sort-of exception of Cathy…it was something you could only get at this restaurant). So, I ended up changing my mind. As it was Amanda got what she always gets at the Brown Dog Deli…the Mesquite Turkey Croissant Sandwich ($7.95), which is made up of brie cheese, applewood-smoked bacon, sprouts, red onions, and cranberry-pepper jelly, served on a croissant. It is her favorite thing on the menu. Richie’s favorite sandwich was no longer on the menu, so he decided to try something very different, the Apple “Butter” Jeans Sandwich ($7.95), which is composed of warm melted brie, sliced Granny Smith apples, local apple butter, fresh arugula, mesquite smoked turkey, honey ham, and prosciutto, served on a panini-pressed local French baguette. Cathy really was interested in the chili that was being offered that day, so she decided she was going to do a cup of that. It was the Southwest Beef and Beer Chili ($3.95) and she opted to pair it with a Build-Your-Own Grilled Cheese ($5.95), selecting Yellow Cheddar, White American Mozzarella, and Goats Cheese as her three cheeses for the sandwich, and choosing to have all of that toasted up on Sourdough Bread. As for me…I ditched the Hummus and Veggies Wrap and thought to do something I hadn’t seen on a menu anywhere else. I opted for the Gluten-Free Portobello Philly Sandwich…light on the cheese ($6.95). 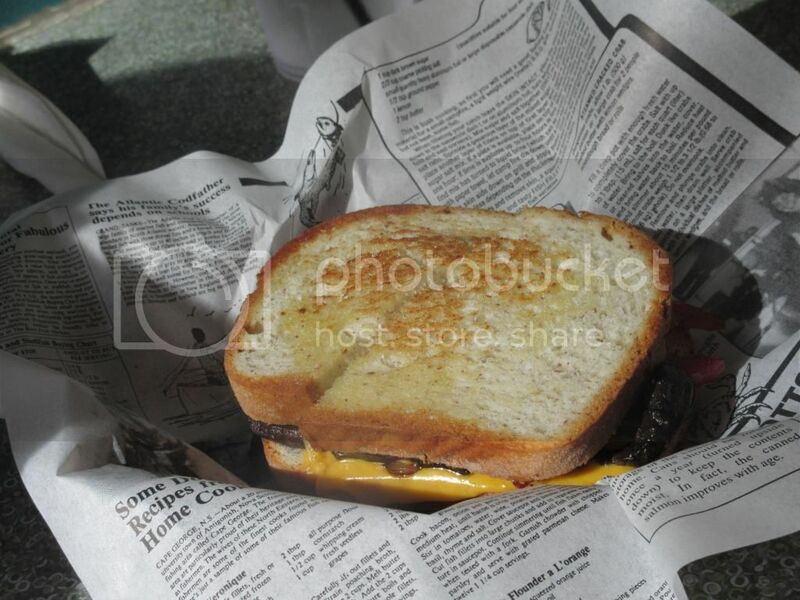 This sandwich was made up of marinated portobello mushrooms, sautéed with peppers and onions, Boar’s Head Vermont yellow cheddar and white American cheese. They had Udi’s bread, which they toasted up to help keep it from immediately falling apart with the wet ingredients. There was no shortage of things to discuss while we waited on food, but when it arrived, I was so excited. Like I said, this restaurant came highly recommended…and it was now packed with a line waiting to get in. We had good timing. And when food did arrive at our table, I was definitely ready to dig into my sandwich. So how was the Gluten Free Portobello Philly? It was fantastic. The marinated mushrooms gave this sandwich a “meaty” texture. And the onions and peppers were cooked to perfection…keeping them flavorful and crisp, but also cooking them down so they weren’t raw. They were fantastic. The bread did start to fall apart, but that’s the nature of gluten-free bread. Especially Udi’s. But, with that aside, they were good about keeping the cheese light, and it probably would have been just as fantastic without it on the sandwich. I thought everything was seasoned perfectly. And I was not alone. Clean plates…that is what we left at the Brown Dog Deli. 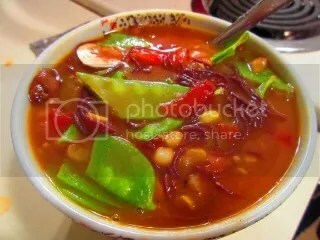 Cathy loved her soup, and would dip her sandwich into the thick and spicy soup. She raved about the creaminess of the cheeses in her sandwich and how they all, surprisingly, worked when put together. And Amanda and Richie both loved what they ordered. Especially Richie…who had to get something he had never had before. Lunch was later than planned, but a total success. And then, we all purchased matching shirts from the Brown Dog Deli as well. 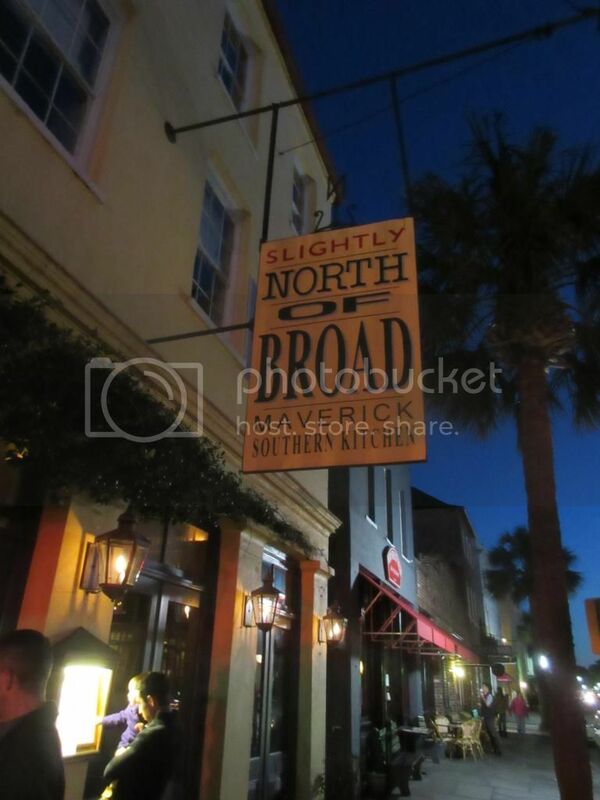 Anyway…if I were to point out one restaurant to anyone wanting to eat the local fare in Charleston, South Carolina…this is the place I would send them. They work with dietary restrictions, they are careful, they create great food…and you will not regret any wait you might have to get a seat inside. It’s worth it. Brown Dog Deli…I’m coming back next time I’m in that fine city. I can’t wait to try something else! Finally the gluten-free world gifts me with…gluten-free ramen! I have been waiting a long time for this. Trust me…when you are faced with never being able to eat something again…finally is what comes to mind when you suddenly are given that something. I never knew how much I missed ramen…until I was suddenly able to have it again. 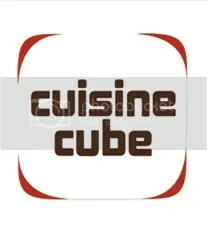 And for this great pleasure, I once again have to credit the amazing Cuisine Cube! Honestly, this is the best money I have ever spent each month. It is always a surprise as to what is inside the cube that arrives in the mail. And I am like a kid at Christmas when I open it up. Back in October’s box…Cuisine Cube included not just one, but two, packages of Lotus Foods Gluten Free and Reduced Sodium Rice Ramen. Two flavors: Millet & Brown Rice with Miso Soup as well as Forbidden Rice with Miso Soup. Color me excited. I was so ready to make some ramen. After all, I studied Japanese all through college and ramen is a way of life in Japan. Now…it was back in mine. Let’s talk about Lotus Foods for a moment, shall we? The products produced by Lotus Foods are recognized for their exceptional cooking quality, taste, texture, and superb nutritional value. The ancient and new rices that compose their products are grown on family farms in limited quantities, on healthy, chemical-free soils. The rice and rice products that are produced by Lotus Foods are found in specialty gourmet, natural food markets, grocery stores, white tablecloth restaurants throughout the United States, becoming a fast favorite of consumers who are seeking healthier options, as well as chefs and foodies across the country. I decided to do an even mix when it came to the two packages of Lotus Foods Rice Ramen that I received from Cuisine Cube. I’d prepare one package as is stated on the package itself. The other…I would cook up in a recipe. The one that I chose to shine on its very own was the Lotus Foods Millet & Brown Rice Ramen. These traditional Japanese-style noodles are created using their specialty rice instead of wheat. Not only are these gluten-free, but both millet and brown rice are some of the most nutritious and easily digestible grains. Nothing could be easier to cook. Simply bring 2 cups of water to a boil. Add in the ramen and simmer for about 4 minutes. Stir every now and again, breaking the noodles apart. When the noodles are soft, remove the pot from the heat and mix in the contents of the enclosed soup package. You can then add in any additional veggies and protein as you wish. I added some corn…because I happen to have a lot of fresh corn in my freezer leftover from this summer. So…what emerged was a hearty, but delicious miso soup. One that is not only gluten-free, but also vegan and non-GMO. 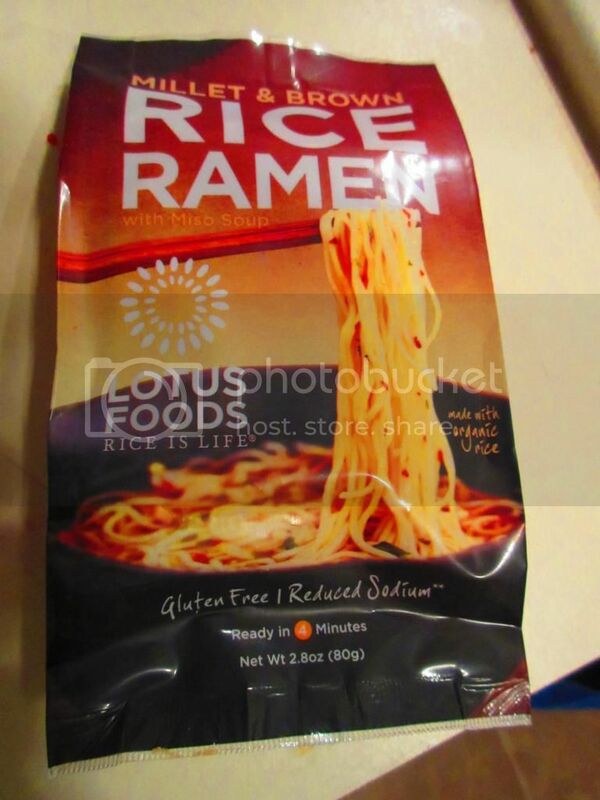 All of Lotus Foods rice products are made from organic rice…and that includes the rice ramen. So…how did it taste? Fantastic. I love that this is also reduced sodium, as a lot of ramen on the market is overflowing with unneeded sodium. I was impressed with that stat on the nutritional information immediately. But as for the taste…the millet and brown rice lend a rich and nutty taste to the noodles themselves. And the soup pack provided a ton of flavor to the hot water. I love the mix of spices that brought a slight bit of heat and sweetness to the entire dish. It was simple to cook and fun to eat. Chopsticks not included. Let’s look at the ingredients in Lotus Foods Millet & Brown Rice Ramen. 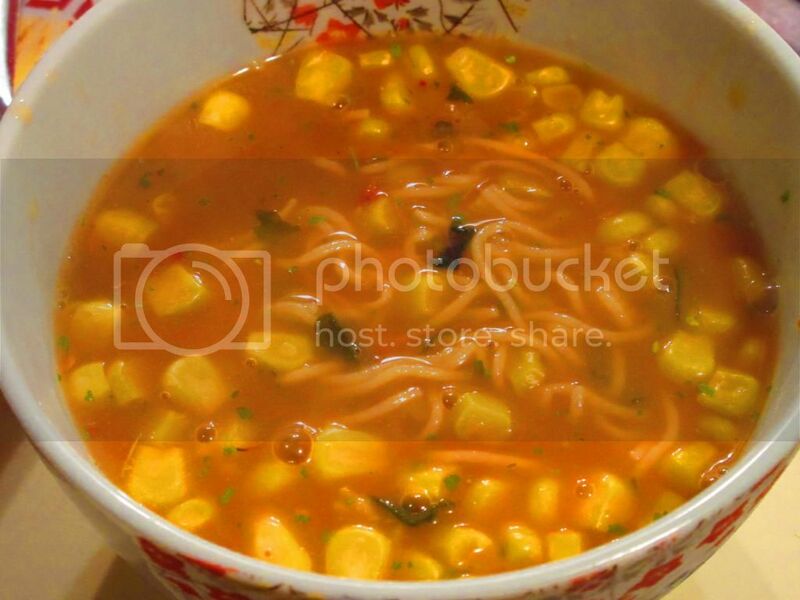 The ramen is made from organic brown rice flour, organic millet flour, water, and organic white rice flour. The soup pack contains red miso powder (cultured soybeans and rice, salt) tamari powder, salt, red onion powder, dried wakame seaweed, sugar, garlic powder, ginger powder, dried parsley, and dried chili peppers. It is gluten-free, cholesterol free, organic, high in fiber and protein, non-GMO, low fat, vegan, and truly delicious! As for the nutritional information…well…the Lotus Foods Millet & Brown Rice Ramen packs contain 2 servings, so a serving isze is 1/2 ramen with the seasoning. This serving will provide you with 140 calories and 1.5 grams of fat. This portion will also give you 460 mg sodium and 1 gram of sugar. See how amazing that sodium level is?! It has 25% less sodium than regular ramen soup. This serving also provides 2 grams of fiber and 5 grams of protein. It may not seem like much when you look at it…but trust me…you will feel full after eating your bowl of this ramen. 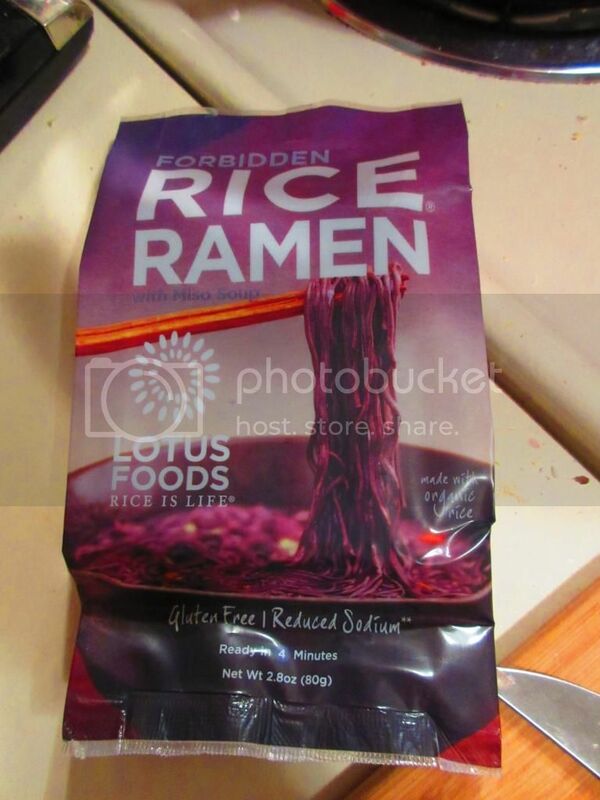 In addition to the Millet & Brown Rice variety, Cuisine Cube threw in the Lotus Foods Forbidden Rice Ramen as well. Forbidden Rice is one of the most nutritious ancient grains. It is made from Lotus Foods heirloom black rice instead of wheat. I love the purple color that these noodles take on. It’s really fantastic. Instead of cooking these up according to the package, I incorporated these into a recipe. But…I’m getting ahead of myself. The forbidden rice ramen also has a delicious nutty taste and a great texture to them. In addition, these noodles are a natural source of antioxidants. This package comes with a savory white miso broth to create the noodle soup with. I, instead, incorporated it with the recipe I made. I added a ton of extra vegetables to create a delicious meal. The recipe will follow the ingredients and nutritional information. Taste was superb. The noodles are amazing and perfect. I wish Cuisine Cube had included more. But, that’s why they have a Stock Up page on their Web site…to stock up. 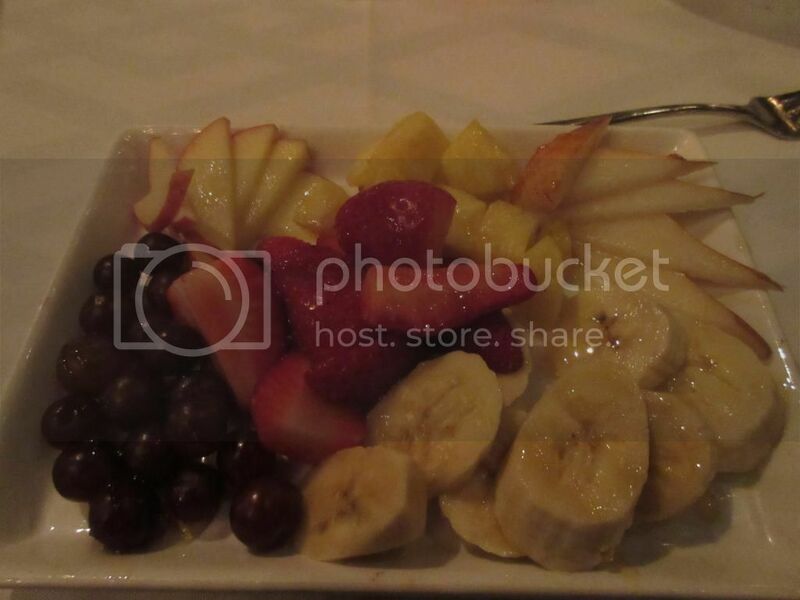 I hope to do just that…because…YUM! The Lotus Foods Forbidden Rice Ramen noodles are made from organic black rice flour, organic brown rice flour, and organic white rice flour, and water. The soup pack is made from white miso powder (cultured soybeans and rice, salt), salt, white onion powder, tamari powder, soybean powder, mushroom powder, dried parsley, and dried carrots. It is gluten-free, cholesterol free, organic, non-GMO, low fat, and vegan. WOOT! As far as nutrition goes, Lotus Foods Forbidden Rice Ramen serves 2 people per pack, so a serving size is 1/2 of the package with the seasoning. This serving will provide you with 140 calories and 1.5 grams of fat. In addition, this portion gives you 400 mg sodium and 1 gram of sugar. Yes, the Forbidden Rice Ramen contians 33% less sodium than regular ramen. That’s fantastic. And, finally, you will have less than 1gram of fiber and 3 grams of protein. With less of these final two nutritional factors, load this up with hearty vegeatbles or your protein of choice. In a large, heavy pot, warm the oil over medium-high heat. Add the shallots and garlic and saute for 3 minutes. Add the ramen noodles and tomatoes and cook, stirring occasionally, for 5 minutes. Add the sugar snap peas, corn, and the seasoning packet from the Lotus Foods Forbidden Rice Ramen and cook for 2 minutes. Season with salt and pepper and serve. Add hot sauce, if desired. Let me tell you, I was amazed with how good this recipe was. And thanks to Lotus Foods Forbidden Rice Ramen Noodles…I was able to create this and cook it up. It had rich depth of flavor. The Forbidden Rice Ramen noodles added a nice hit of bold color. And the soup itself had this great umami flavor. 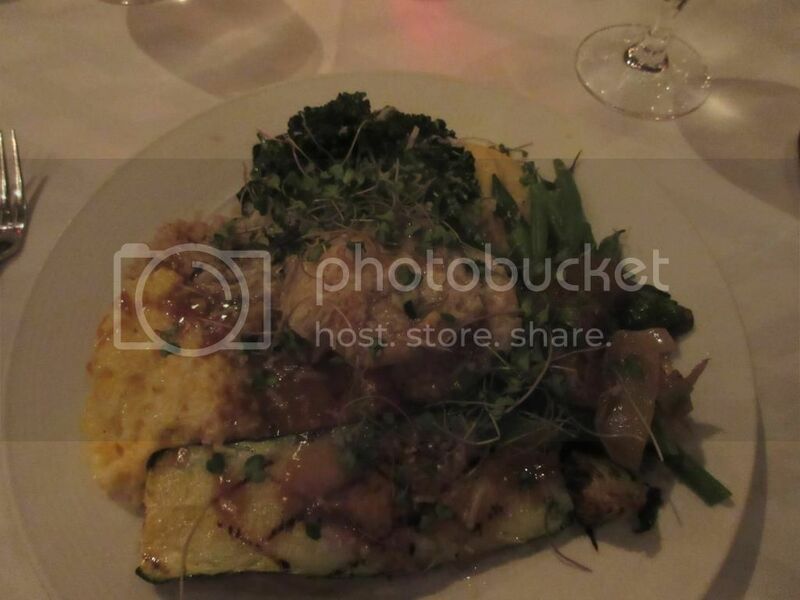 It was rich and loaded with nutrients and fresh vegetables. It was love at first slurp. And there was a ton of slurping going on. 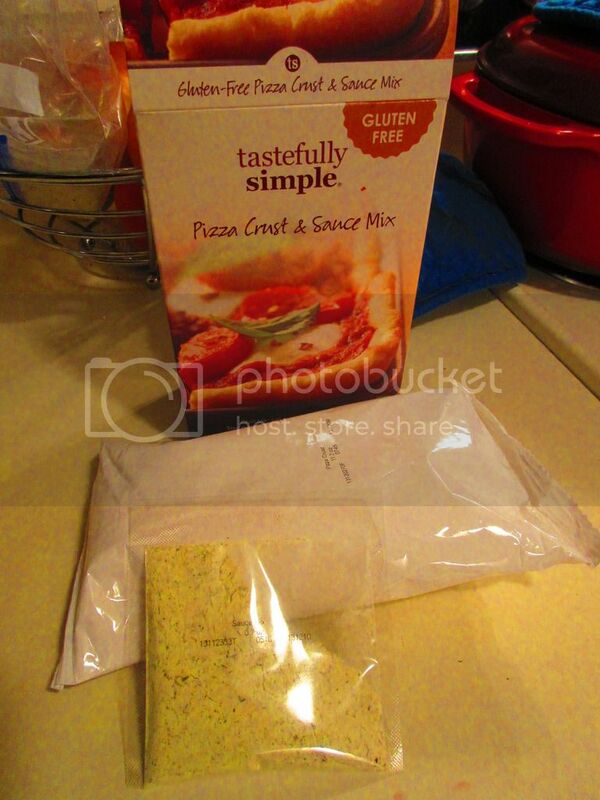 Another product I love, brought to me with great thought and great care from Cuisine Cube. I’m loving this service.